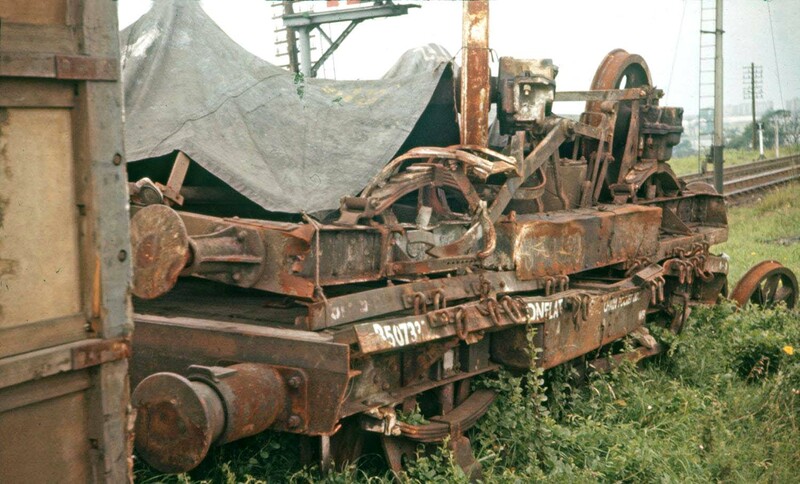 View of the remains of some of the derailed wagons including at least two British Railways Conflat A wagons. The term 'Conflat' is the telegraphic code within the Great Western Railway's coding of railway wagons for a container wagon. Unlike normal wagon loads, containers were only listed to carry furniture or goods (unless they were refrigerated containers, which carried frozen products kept cold by ice) which needed to be placed on a specialist flatbed wagon which had train braking capability due to the fragile nature of the products carried. The Conflat A, which could carry one type 'B', or two type 'A', containers, was the most common; while the Conflat L, which could carry three smaller containers for bulk powders, was also produced in large numbers.